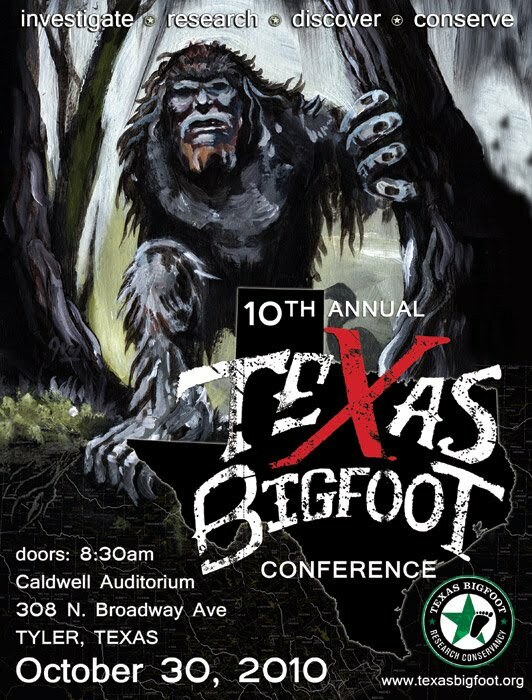 The 10th annual Texas Bigfoot Conference will take place this Saturday. Take a look at the details and the line-up of speakers below. 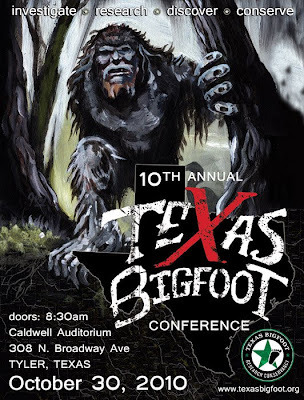 The TBRC is funded by membership dues, fundraisers, and the annual Texas Bigfoot Conference, in addition to donations and grants. The TBRC desires to enhance the credibility of bigfoot/sasquatch research and facilitate a greater degree of acceptance by the scientific community and other segments of society of the likelihood of a biological basis behind the sasquatch mystery. The host hotel for the 2010 Texas Bigfoot Conference is the Tyler Sleep Inn and Suites, located at 5555 South Donnybrook Avenue in Tyler (903-581-8646). For those planning to attend, it is recommended that hotel rooms be reserved well in advance. In order to qualify for the discount price, the hotel needs to know that the person or group is in town for the 2010 Texas Bigfoot Conference. The Sleep Inn and Suites will provide a complimentary hot buffet breakfast and a meeting room for Conference attendees. The overflow hotels are: Comfort Suites (903-534-0999); and Holiday Inn Select (903-561-5800). Refund Policy: If you are unable to attend the conference after submitting your advance registration, we humbly and regretfully must acknowledge that there is a no refund policy and will be considered donations made to the organization in support of the advance planning and preparation that is being put into this event. We reserve the right to refuse admittance to anyone. Rude, disruptive, or confrontational behavior will absolutely not be tolerated and will result in immediate removal from the premises by law enforcement. 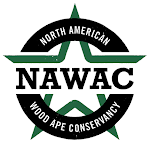 This is a great opportunity to hear and visit with the leaders in sasquatch research. I will be there and hope you can find time in your schedule to attend as well. The chance to hear Bob Gimlin speak at the banquet Saturday night is worth the trip alone. I recently ran across an interesting article on the BBC website that really caught my attention. The author, Matt Walker, gives us a look into some pretty amazing behaviors being exhibited by wild chimpanzees in Guinea. Read the full article here. It is pretty commonly known that chimpanzees, as well as other great ape, are facing increased pressure from poachers due to the high demand for "bush meat" in parts of Africa. Snare traps are the most commonly used tool to capture the targeted species and it seems chimpanzees are beginning to recognize this technique and are fighting back the best way they know how. Primatologist Gaku Ohashi and Professor Tetsuro Matsuzawa observed wild chimpanzees disabling snares traps. The discovery was made by accident as the team was following a group of the apes living in the jungles near Bossou, Guinea to observe their social structure and behaviors. More incredible still is that the chimps seemed to be actively seeking out the snares with the express purpose of disabling them. 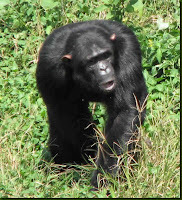 According to the article, snare injuries to chimpanzees are common at many sites across East and West Africa; however, that is not the case with the chimps being observed in the Bossou region. This was deemed very curious as these chimpanzees live near human settlements where poachers are abundant. Now, it seems, we know why. Ohashi and Matsuzawa of the Primate Research Institute of Kyoto University, Japan, observed five male chimps, both juvenile and adult, attempting to break or deactivate snares. 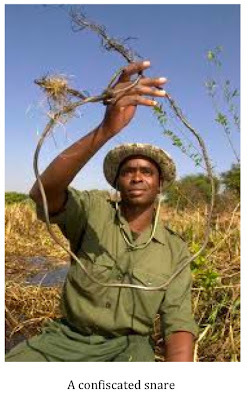 Twice the chimps were successful in ruining the traps set for them. It may be helpful to understand how these snare traps work. According to the article, a typical snare consists of a loop of iron wire connected by a vine rope to an arched stick, often a sapling. The sapling puts tension on the rope and once an animal passes through the wire loop the trap springs, the sapling straightens, and the wire tightens around the leg or neck of the animal. The snares are indiscriminate killers, catching and killing whatever species come into contact with them. The male chimpanzees of Bossou seem to be working on getting rid of these traps themselves. 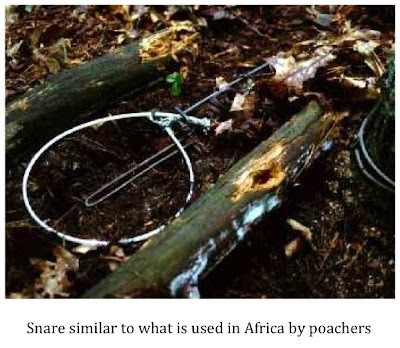 "They seemed to know which parts of the snares are dangerous and which are not," Ohashi said. 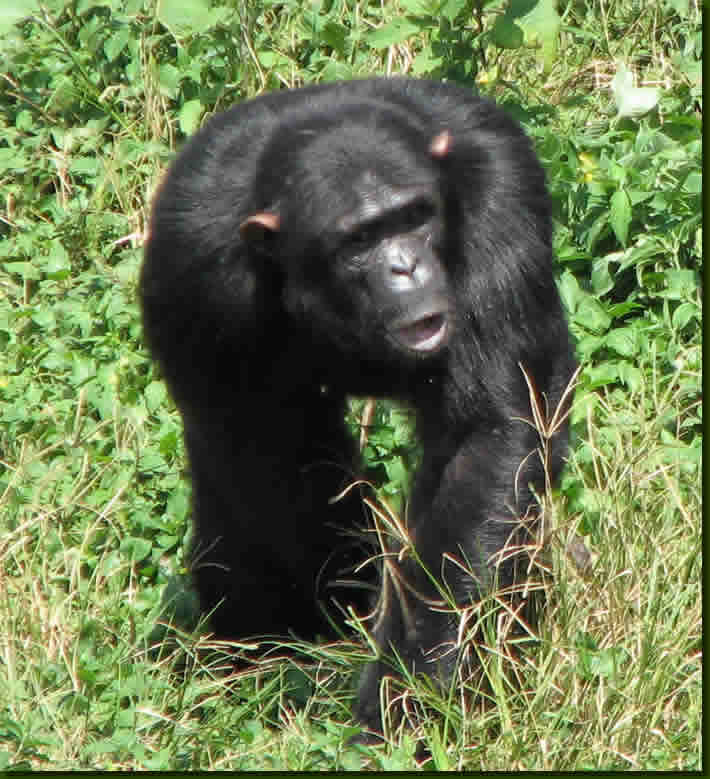 In an article for the journal Primates, the researchers recounted six different instances where male chimps were observed trying to deactivate snares. 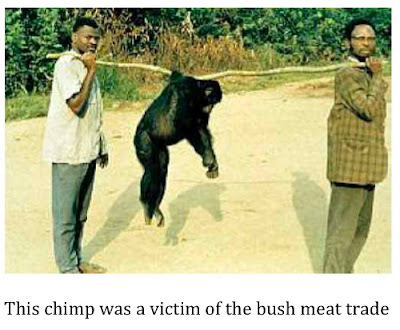 Most of the time, the chimps grabbed the sapling and simply shook it until the trap broke. In each case, the apes avoided touching the dangerous wire loop. The observations of these primatologists bring up an interesting question. How did the chimps learn to deactivate these traps? It has long been assumed that chimpanzees learn by trial and error. This doesn't seem to fit here; however, as an error would likely prove to be fatal. The observations suggest these great apes are capable of learning by observing events. "The observations indicate that chimpanzees can learn some manners without trial and error," said Ohashi. In addition, the behaviors learned are being passed down to younger chimpanzees. The researchers watched as an older male deactivated a snare while a juvenile male watched intently from a safe distance. Snares continue to pose a major threat to great apes in Africa as chimps in other regions have not yet figured out how to deactivate traps set for them by poachers. Why this particular group is so far ahead of the curve is subject to speculation. 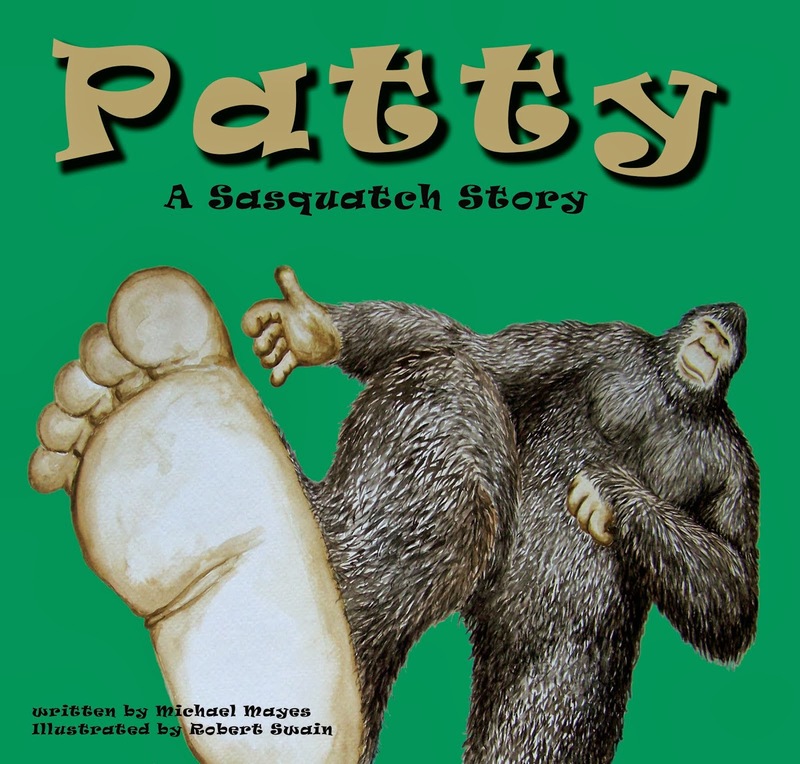 As always, whenever a discovery that reveals the exceptional intelligence level and/or problem-solving abilities of a known great ape species is made I ponder how it might possibly relate to the quest to document the sasquatch. If the sasquatch is at least as intelligent as the known great apes, but fewer in number, the challenge facing us becomes obvious. Are sasquatches intentionally avoiding and/or disabling the North American version of an ape trap? I am, of course, speaking of game cameras. A long-standing point of contention among researchers is whether or not game cameras, or camera traps, have a realistic chance of documenting this elusive species. Some believe that sasquatches know what cameras are and what they do and so avoid them. I think that is complete malarkey. While I don't believe that the species has any idea what a camera does, what could be true is that sasquatches associate them with people, just as the chimpanzees of Guinea associate snares with poachers. If sasquatches have an aversion to humans, as I believe they do, then they would likely have an aversion to cameras set out by humans as well. While these camera "traps" are a far cry from the deadly snares of the African jungles, it is possible they put sasquatches on high alert. Again, I don't think these creatures have any idea what these cameras do but if they understand humans are responsible for the presence of these alien devices that may be all they need to know. If so, those of us who seek the "discovery photo" are going to have to start thinking more outside the box as far as how to best camouflage and hide these cameras. Avoidance of the cameras would be the likeliest behavior but it isn't too far-fetched to think a sasquatch might attempt to disable one if it is perceived as a threat. I don't mean that they are going to steal batteries or memory cards, somehow knowing the function of the camera, to prevent discovery. Rather, I mean they might simply destroy the camera. There are many cases of game cameras going missing. Usually, and rightfully so, other humans are assumed to be responsible. This is certainly the correct explanation most of the time; however, there are instances when this just doesn't seem likely. Sometimes cameras in incredibly remote locales disappear. Could the sasquatch be responsible? Other times cameras are found smashed to bits. My experiences with the TBRC have shown me that black bears are most often responsible for these incidents. While this is a logical explanation in some places, Southeast Oklahoma, for example, it would be a bit more of a stretch in some other areas where bears are absent or very rare. Any animal will become aggressive if it feels threatened or if it's territory is infringed upon. Cameras could be seen as both a threat, due to their association with humans, and as an unwelcome interloper. I do not want to sound like camera trapping is futile. To the contrary, I still feel it is the best chance, short of a hunter taking a specimen or a road-kill type scenario, that we have of documenting the species. I also feel, despite the challenges involved, the reason we don't have definitive photographic evidence already is due to the fact that there has not been a sufficiently large and well-funded attempt made to capture said evidence to date. I believe that sooner or later, we will get the photograph we seek. We may have to vary our techniques, locations, etc. as putting an uncamouflaged camera on a stake or tree may not be good enough to fool a creature as intelligent as a great ape. However, it just takes one animal making one mistake to give us what we need. 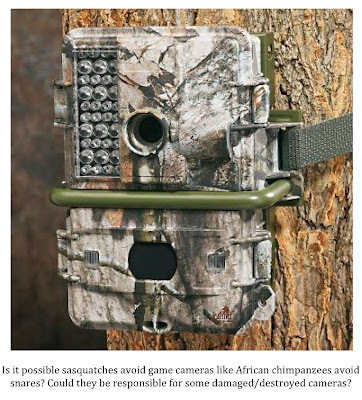 Unlike the chimpanzees of Africa who, if they make a mistake, can lose their lives to a poacher's trap the sasquatch that eventually makes a mistake and is "trapped" via a camera may very well end up saving his/her entire species. Let's hope that "mistake" happens soon. 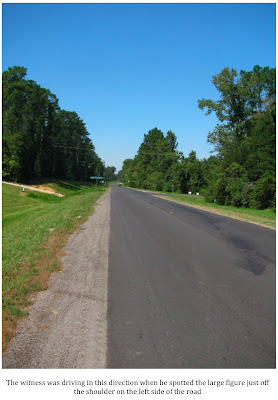 There is a fine article on the website of The Grapeland Messenger about the return of black bears to East Texas. The piece, written by Dana Goolsby, can be accessed here. Goolsby's article touches on several aspects of the return to the Piney Woods of the black bear. One of the first things Ms. Goolsby does is advise hunters to not be too quick to fire their weapons at what they assume to be a feral hog. This would be especially true in the low light conditions of dawn and/or dusk. As is correctly pointed out, bears and hogs have very similar shapes and sizes. Many think of bears as being much larger than hogs. This is simply not the case. Most East Texans are going to be seeing Louisiana black bears. These bears rarely exceed 300 lbs. As many hog hunters can tell you, feral hogs can and do get this large. 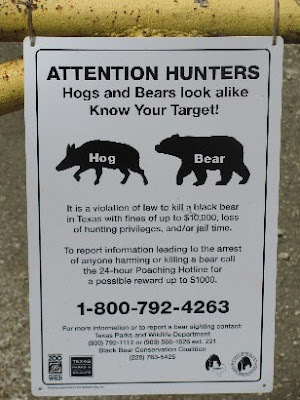 The Texas Parks & Wildlife Department realizes misidentification could be a problem and has posted signs (see pic below) in the Davy Crockett National Forest reminding hunters to take extra care when identifying their target. Goolsby also point out that shooting a protected black bear could result in a fine of up to $10,000, the loss of hunting privileges, and/or jail time. If you are going to shoot a bear in Texas you had better be able to show you felt you were in grave danger. Goolsby also addresses whether or not East Texas is suitable habitat for black bears. She correctly points out that it indeed is a great place for bears to live. 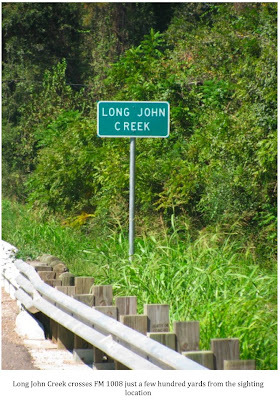 The Davy Crockett National Forest is situated in East Texas within the Trinity and Neches River basins. The forest encompasses over 160,000 acres in two counties. Add the 150,000+ acres in the Angelina National Forest, the 160,000+ acres in the Sabine National Forest, the 163,000+ acres in the Sam Houston National Forest, and the 97,000+ acres within the units of the Big Thicket National Preserve and you have more than 580,000 acres of prime bear habitat in the Lone Star State. Add to that acreage the vast amount of undeveloped and heavily wooded private land in East Texas and you have a virtual bear paradise. In fact, Texas once had an enormous black bear population until they were hunted out in the early 1900s. The bears are simply rebounding to a point where they are filling in the ecological niche they once occupied in Texas. 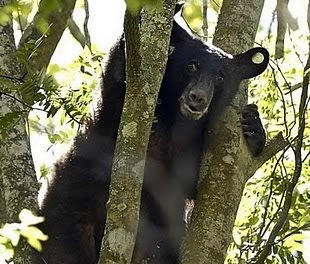 From time to time in the past, credible bear sightings have trickled in from East Texas. It was assumed that the majority of these bears were young males looking for mates and territory of their own that crossed the Sabine River from Louisiana. In far Northeast Texas it was thought to be boar bears from Arkansas and Oklahoma - both states have very healthy bear populations - that were venturing into Texas. More and more; however, sows with cubs are being reported. Just this week a friend of mine who lives in Upshur County in East Texas reported that an acquaintance of his had spotted a female black bear with cubs on her property (I hope to have some more on this soon). Are these sow bears the exception rather than the rule? Only time will tell but if females begin to take permanent residence in Texas forests the bear population could rebound quickly. That is, as long as the bears remain protected. Goolsby gives also give some historical perspective on what led to the extirpation of the black bear in Texas. In particular, the black bear hunters of the Big Thicket are singled out (I plan on doing a post on them in the future). She also gives the standard good advice on what to do should you encounter a black bear in the wild. Her advice is something we've all probably heard before but it is a good to be reminded. Black bear have managed to survive and even thrive in areas where their larger cousin, the grizzly bear, has been hunted out. They have managed to survive because they are generally shy and retiring around people. They, as a whole, prefer to climb a tree or run away rather than fight. This instinct has served them well. Keep in mind; however, that they are powerful and potentially dangerous animals not to be trifled with. As Goolsby states in the article, you should never run from a bear. Running tends to trigger any predator's instinct to chase. It automatically puts you in the "prey" category. Back away slowly and never turn your back to the bear. Bears aren't only being spotted in East Texas. The video below comes from a ranch near Leakey, Texas which is about 50-60 miles Northwest of San Antonio. The animal in this video is likely a bear that has travelled up from Northern Mexico or East from the Big Bend region of the state. Regardless of where the bear came from it's presence makes the case that bears are re-establishing a viable population in the Lone Star State. There is little doubt that bears are returning to Texas. I think this is a great thing. There will, no doubt, be some times when humans and bears come into contact with each other but if common sense is exercised incidents that turn out badly should be able to be kept to a minimum. I would recommend that all you deer hunters pack a camera as well as your gun this fall. In this state there is just no telling what you might get the chance to snap. Black bear, cougars, black panthers, etc. all might wander by your stand. Who knows something even more spectacular, and taller, might make an appearance as well. If any of you hunters captures anything interesting I would love to see the photos. I might be able to recommend what your next step should be if you do manage to document something rare. How about one more alligator story? 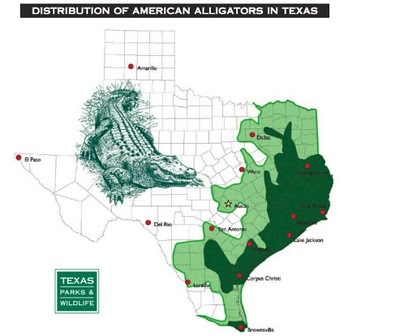 This one comes from San Antonio, Texas, which, according to the graph below, is on the extreme western edge of what the Texas Parks & Wildlife Department recognizes as gator habitat. According to an article on the Wildlife News and Habitat Management website, a 9-foot long alligator was shot and killed by game wardens back in July of 2007. 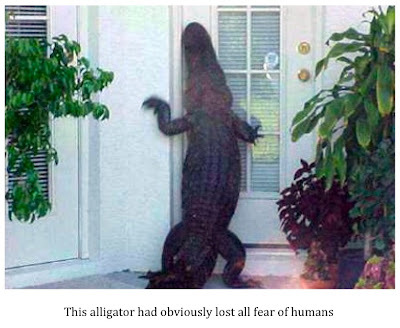 The gator had seemingly lost it's fear of humans and was approaching homes. 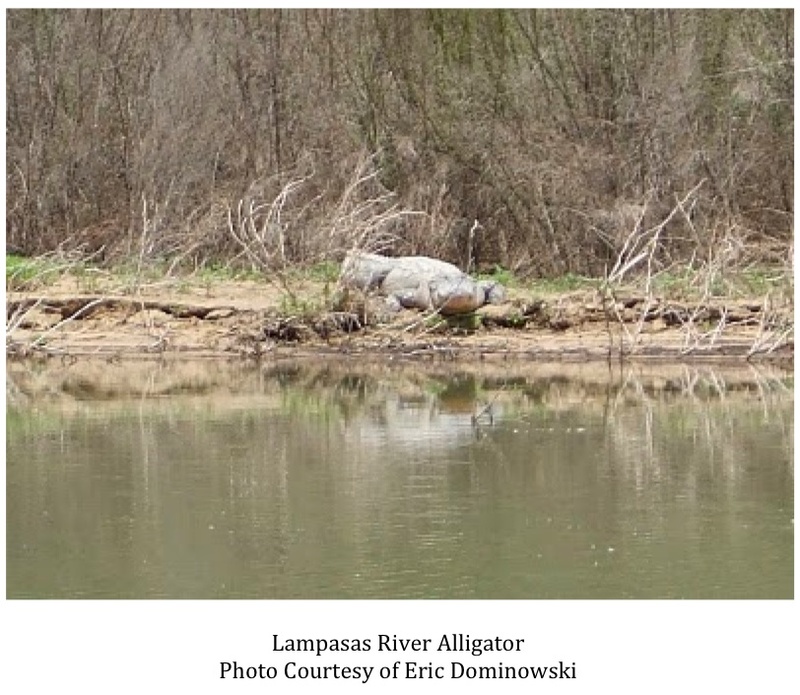 As you can see by the picture below, it would be hard to argue with the assessment made by the game wardens that this was a nuisance animal.The original article can be accessed here. Texas Parks & Wildlife game warden Danny Shaw is quoted as saying, "We did not want it to have contact with human beings." This is essentially what led to the decision to put the animal down as opposed to relocating it. According to Shaw, Choke Canyon Reservoir is the usual destination for alligators that need to be relocated from the San Antonio area (this is something I did not know). Game warden Shaw said that relocation was not an option in this case as Choke Canyon is a public reservoir and not an acceptable alternative home for alligators that have lost their fear of people. 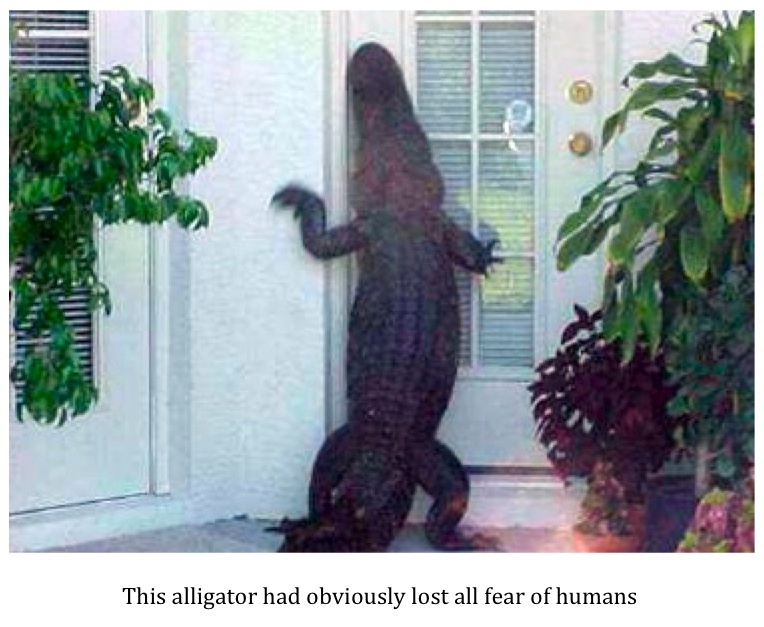 The article also mentions an alligator that stopped traffic in the same area in April of 2007. That gator escaped into a drainage area when chased off the road by police. It is possible this was the same animal but that can't be known for sure. 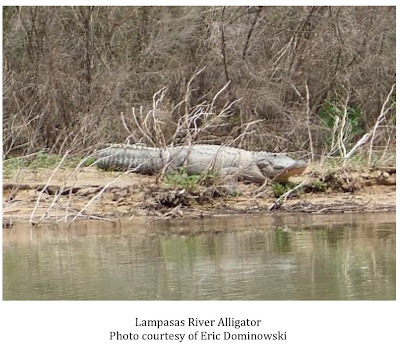 While the last two posts about alligators involve incidents that took place back in 2007, they do provide the documentation I was looking for as to sightings of these big reptiles as far west as the I-35 corridor. Maybe the alligator sightings in Bell County over the last several years are just of animals in their native habitats and not of displaced or out of place creatures after all. It does seem that alligator sightings up and down the I-35 corridor from the Dallas-Ft. Worth Metroplex , through Central Texas, and into the San Antonio area are becoming more common. It will be interesting to see if the trend continues. 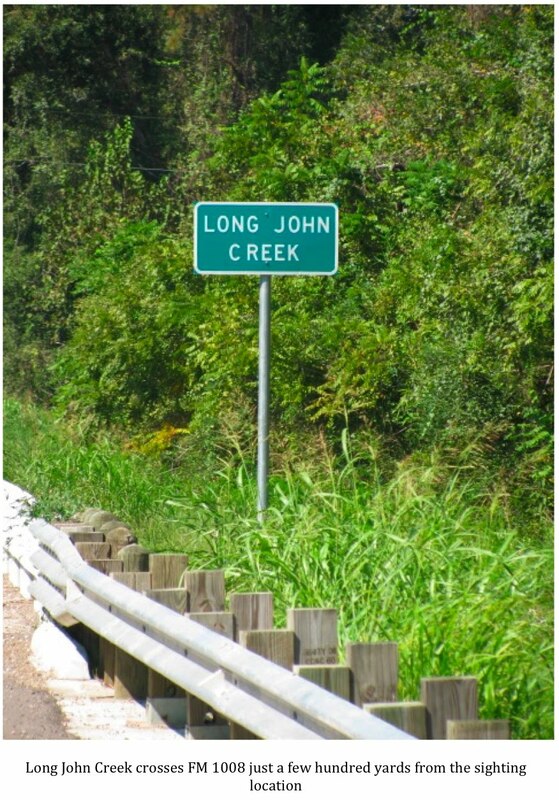 I have been hearing tales of alligators haunting Central Texas reservoirs, creeks, and rivers since I arrived in the area, way back in 1987. In particular, Stillhouse Hollow Reservoir and Lake Belton were said to be habitats for these big reptiles. I never really believed these stories were true. I grew up in Southeast Texas where gators are plentiful and just didn't feel like the habitat was suitable for alligators in my new home territory. I have fished Belton and Stillhouse now extensively for over a decade and have never seen any sign of alligators in either body of water. I have also fished the Lampasas, Leon, and Little Rivers, Nolan and Salado Creeks, and numerous privately owned stock tanks and lakes without ever seeing anything that would lead me to believe that alligators were present in the area. That all changed last April when a gentleman named Eric Dominowski spotted, and photographed, a big gator on the banks of the Lampasas River. You can read about that sighting here. This incident inspired me to dig a little deeper and see if I could find any other source that documented gators in the Central Texas region. It took a while but I did find something. 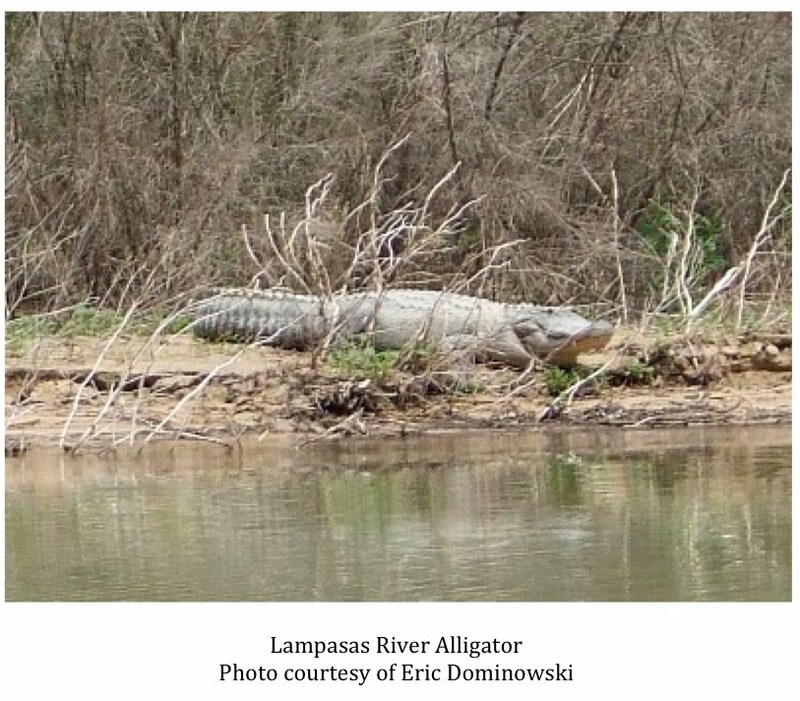 An article on the Wildlife News and Habitat Management site documents an incident where an 8-foot long alligator was killed by law enforcement officers back in June of 2007. The article can be accessed here but I will attempt to summarize it for you below. An approximately 8-foot long alligator was spotted lying near the intersection of FM 436 and FM 1123, roughly a mile from the Lampasas River, about 2:20am by a traveler who called it in to the Bell County Sheriff's Department. 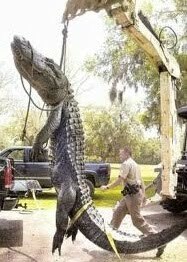 The big gator weighed in at about 200 lbs. and wasn't too thrilled to see local law enforcement personnel upon their arrival. Sheriff's Deputies contacted Texas Parks & Wildlife personnel and were advised to capture the gator, if possible, but to shoot it if it became aggressive. As you can probably imagine, Bell County Deputy Sheriff's don't exactly get a lot of experience in wrangling alligators and failed in their attempts to subdue the big reptile. They did succeed in making it angry; however, and felt it was best to shoot the gator in the interest of public safety. "It was a safety issue," Bell County Sheriff's spokesman Jimmy Lewing said. Since the gator was found on a state maintained highway, the Texas Department of Transportation was called to dispatch maintenance workers to the scene to remove the animal. The article quotes Ken Roberts, TxDOT spokesman, as saying, "We picked it up, hauled it away, and buried it." He added, "We pick up deer, cows, horses, and dogs...that's what we do." Roberts did admit picking up a road-killed alligator was pretty unusual. "It's probably the strangest thing we've picked up in a long time," he said. Interestingly, the maintenance workers who were actually dispatched to the scene weren't surprised at all. "They said there's gators in the streams and rivers," said Roberts. According to the article, Derrick Wolter, a Texas Parks & Wildlife biologist agrees with the assessment of the TxDOT maintenance workers. He said that there have long been reports of alligators swimming in the waters of Stillhouse Hollow Reservoir and Lake Belton. "I don't know if they are illegal pets that someone let loose or if they are naturally occurring," he said. Wolter guessed the gator was a male looking for a mate due to the time of year. Alligator breeding season usually occurs in May but can certainly extend into June. Since the gator was disposed of before it's gender could be determined this remains conjecture. As you can see from the graphic above, the Central Texas area, which includes Stillhouse Hollow Reservoir and Lake Belton, is on the extreme Western edge of recognized alligator habitat. This being the case, maybe we should not be surprised that these big predators are present in the area. While their numbers are, no doubt, much lower in Central Texas than points farther East, the photos snapped by Eric Dominowksi prove they are present in the area. I would ask any readers who have had an encounter with an alligator anywhere West of I-45 to let me know. I would like to hear your story. Oh, and, as always, keep those cameras handy at all times. Ok, so this is a bit off topic but I thought it was funny. Check the picture out below. 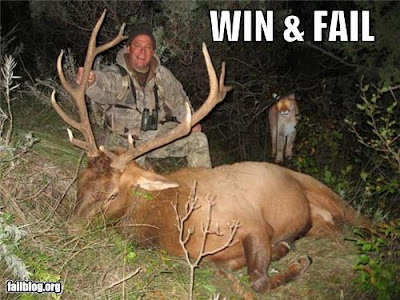 It is from the Fail Blog site, which typically has some very funny stuff on it, and features a hunter with his, for now, trophy. Somehow, this seems a lot like something that would happen to me. Now back to the more serious stuff out there. I received an email from a reader a day or two ago that included a couple of awesome photos. Check out the email and the photos below. Attached are 2 pictures I took from my apartment balcony in Plano Texas in Apr 2010. My balcony overlooks the Arbor Hills Nature Preserve. My wife and I were sitting outside enjoying the end of the day when we noticed that several crows were very excited about something not too far away from us. 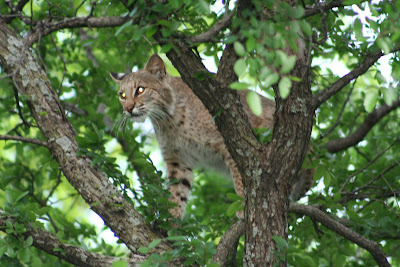 As luck would have it, this young bobcat scrambled up the tree apparently trying to escape the crows. He ended up directly in from of our second-story view. I hurried back into the apartment to grab a camera and took several pictures, the best two of which I attached here. The cat remained "treed" for about 20-25 minutes until the crows moved on to something else. You can see that the cat was close enough to capture the light from my camera's flash. I came across your blog tonight concerning the large black cat in Plano and I have it admit, I am skeptical. 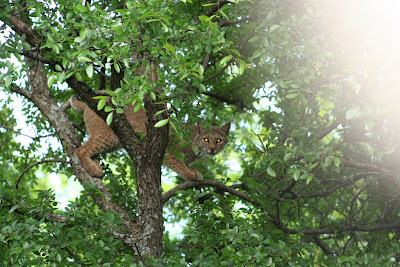 I did however, want to assure you that the bobcat population in Plano is alive and well around here. I jog the park frequently and have ran into several others that have seen the cats in the park. I work at Presbyterian Hospital of Plano which is just one mile away & we frequently see bobcats behind the hospital & have even seen a mother with kittens.!!! Good times in Plano Texas. These terrific photos of a young bobcat go to show that big cats can and do make the Metroplex area their home. Certainly there is a big difference between a population of bobcats and a population of cougars. 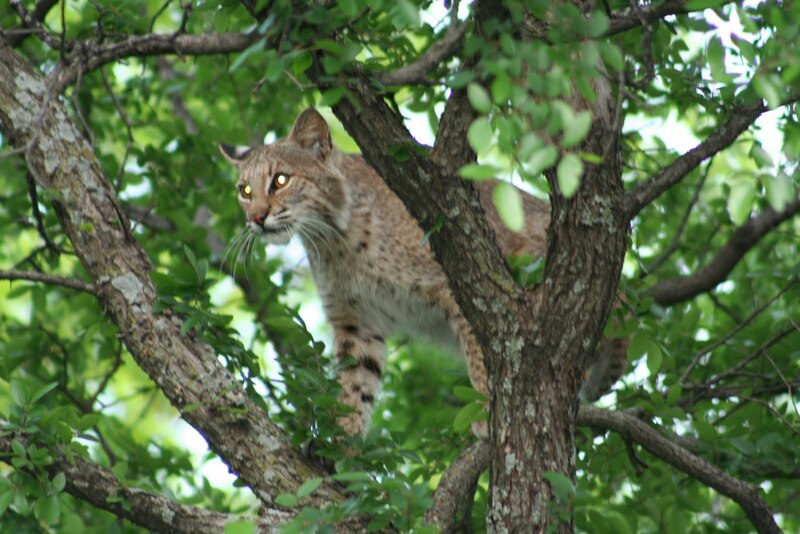 Keep in mind, however, that if there are enough resources to support these bobcats it is not unreasonable to assume that a small population of larger cats could make a living in the area as well. The reader who sent me these photos remains skeptical of panther sightings and that is ok. Skepticism is not a bad thing. There is a world of difference between being skeptical and being closed-minded. I, myself, am a big believer in the "where there is smoke there is fire" way of thinking. Big cats continue to be reported in this area. 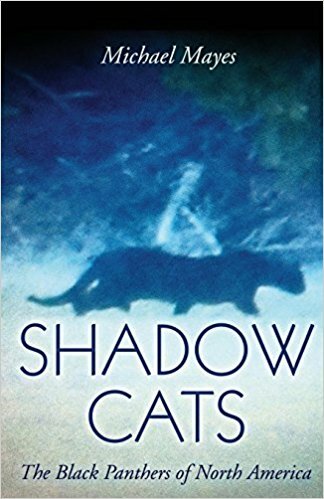 While some people are, no doubt, misidentifying bobcats as panthers, the reports of cats with tails almost as long as their bodies, some being jet black in color, don't jibe with the theory that everyone is seeing bobcats. The Plano area continues to be a real hot spot for big cat sightings. Bobcats, cougars, and black panthers continue to be reported on a fairly regular basis. I have a backlog of reports that I need to put up on the site regarding these sightings. Please keep me informed if you happen to see a big cat of any kind in an area where they officially do not exist. 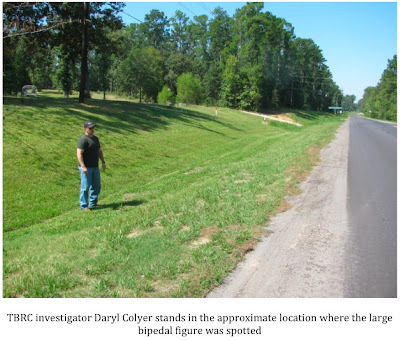 This interview was conducted as a result of an alleged sighting of a large upright biped that matches the description of a sasquatch in Liberty County, Texas in February of 2010. The witness was driving home from a meeting in Kennefick on FM 1008 at approximately 9:30pm. The witness rounded a slight curve in the road and spotted a large upright figure standing just off the shoulder on the opposite side of the road. The witness caught a brief glimpse of the figure as he passed at 50-55 mph. The witness, wanting to get a second look, stopped and turned his truck around at the first opportunity. When he arrived back at the sighting location the figure was gone. The witness then grabbed a flashlight, which he keeps in his truck at all times, and stepped out of his vehicle to see if he could spot the figure. He reported that he was shaking and was more than a bit unnerved by what he had seen so he didn't venture past the shoulder of the road to look. He did not manage to spot the figure again. The sighting lasted only a few seconds but the witness claims to have been only 20-30 feet away and got an overall impression of the size of the figure. He initially described the individual as very broad and 6-6 1/2 feet tall. He was not able to discern color and could only say it was dark. The witness said it was almost like seeing a silhouette. The witness discerned no eye-shine but did have the impression the figure was facing his oncoming vehicle. The witness did not hear or smell anything unusual at the time of the sighting or after returning to the site upon turning around. 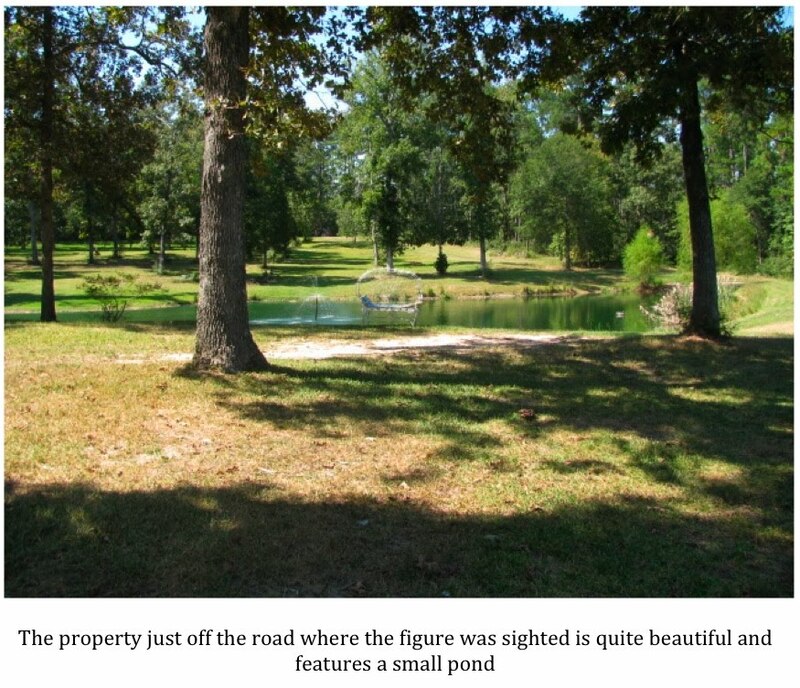 The side of the road where the figure was seen is a privately owned piece of property with a residence on it. When asked if the figure could have been a person, possibly the property owner, the witness said firmly, "There is no way it was a person." Fellow TBRC member Daryl Colyer and I visited the witness and the sighting location on Saturday October 2. We met and interviewed the witness again at that time (the initial interview was done over the phone). We were also able to meet one of the owners of the property where the sighting took place. She confirmed that back in February the witness had asked her whether her family had spotted any unusual animals on the property. The property owner said that the witness was told a large cat had been seen. She said the witness then asked about anything "sort of like a primate." The witness then shared the story of his encounter with the property owners. It should be noted at this time that the property is surrounded by forest. The opposite side of the road is heavily forested as well. 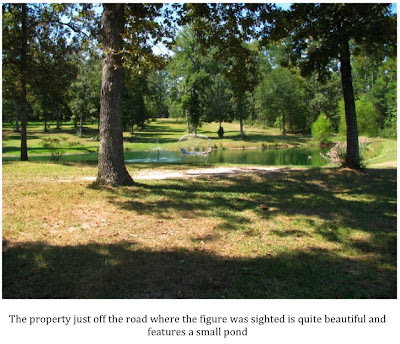 The property also features a small lake/pond that lays right off the road and would have been directly behind the location where the figure was spotted. The couple who own the property where the incident took place know the witness and are split in their opinion of what happened that night. The husband, who was at work when we visited and whom we did not meet, is skeptical and feels the witness likely misidentified a person or an animal of some kind. The wife was present during our entire investigation and believes the witness may have indeed spotted a sasquatch. It is important to note that neither of them feels the witness is lying or perpetrating a hoax. Colyer and I both reached the conclusion that the witness saw something for which he could not account. The description given of an upright large biped seems to rule out known animals that inhabit the area. It would also seem logical to assume if it had been a person walking along the road they would have still been present when the witness turned around and returned to the spot where the figure was seen. In addition, a re-enactment of the sighting seems to indicate that the figure's size would preclude it from being a human. 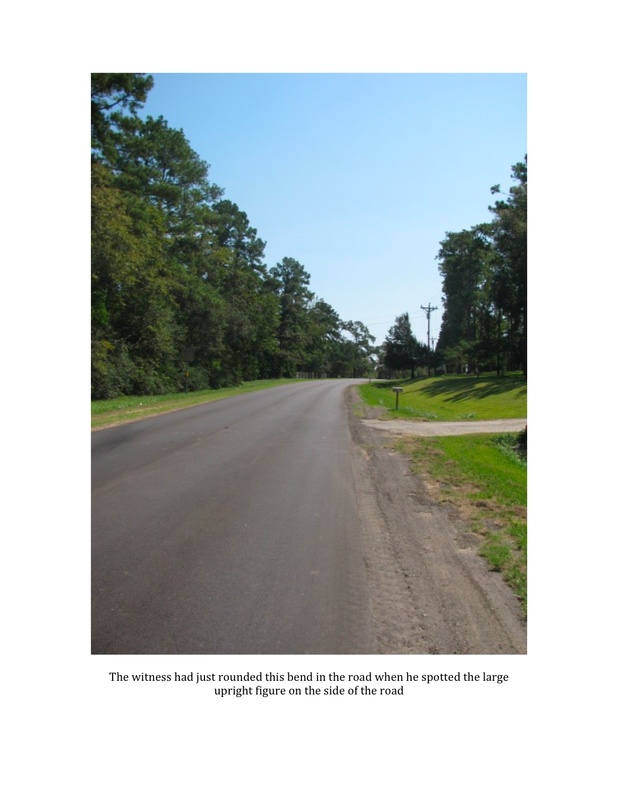 We had the witness stand in the road in the approximate spot from which he saw the figure. Investigator Colyer, who stands right at 6 feet tall, stood in the approximate spot where the figure was located. The witness stated that the figure was far taller and wider than Colyer. 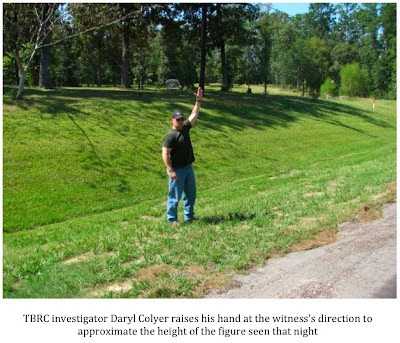 Investigator Colyer then raised his arm over his head and the witness agreed the figure stood at a height approximating that of his upraised hand. This would make the figure at least 7 feet tall. In addition to the re-enactment, we were able to see that there are no trees, structures, etc. in the area that the witness could have misidentified. 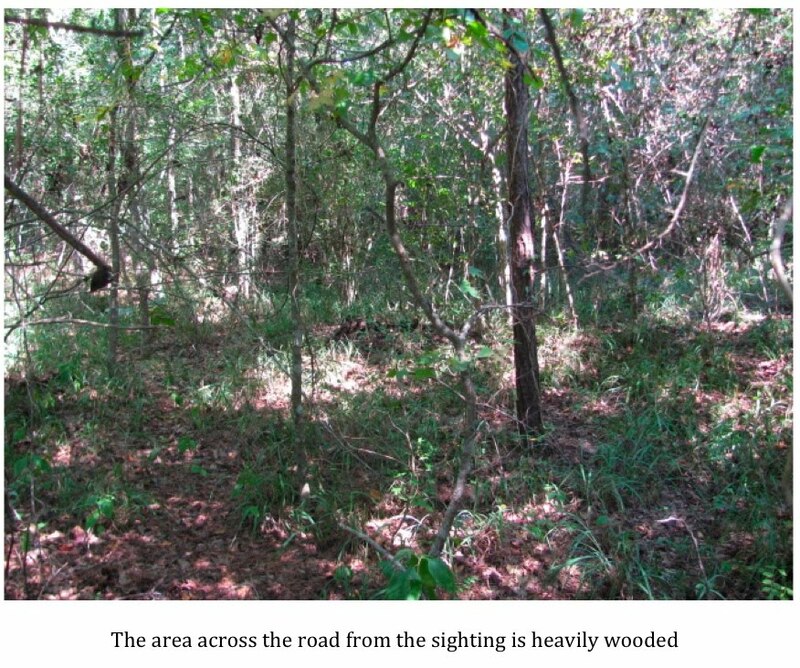 The TBRC continues to collect and investigate reports of encounters, both contemporary and historical, with bipedal ape-like creatures in Liberty County and surrounding Big Thicket Counties. Southeast Texas continues to be the most prolific area in the four-state region for reports of encounters of this nature. The official report will be posted on the TBRC website shortly. It will include additional photos from my trip and aerial photos of the area taken by TBRC member Ken Stewart. As always, an interactive map of the area in question will also be included. If you haven't visited the TBRC site I would invite you to do so. It is extremely cool, user friendly, and has a very large database of sightings that you can browse through.